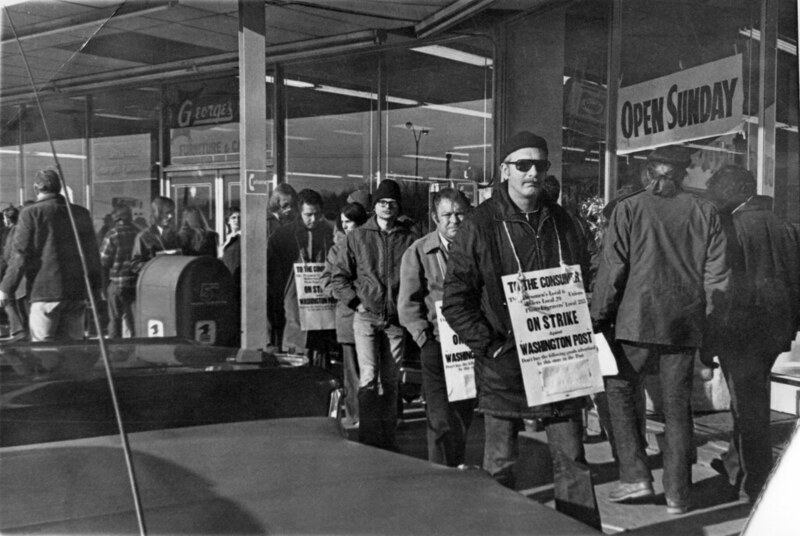 A mass picket line by striking pressmen and supporters in front of a George’s appliance store in Greenbelt, Maryland in December 1975. Photo by Reading/Simpson, non-commercial use permitted. 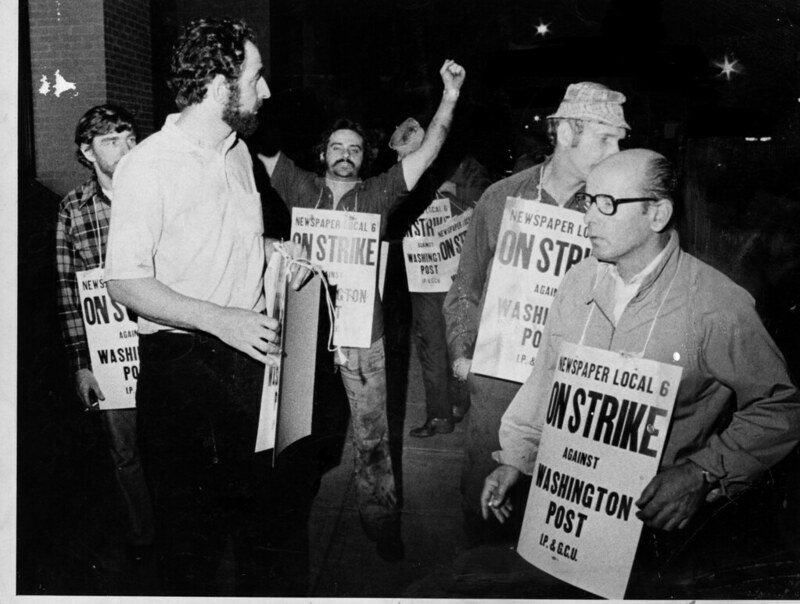 The International Printing and Graphic Communications Union Local 6, the pressmen’s union, was engaged in a bitterly fought strike at the Washington Post that reached a turning point in December 1975. When the strike first began on October 1, a number of advertisers switched to the rival Washington Star as the Post struggled to publish a credible newspaper. It appeared for a time that the Star might supplant the Post, unless the strike was settled. But the management gradually produced more and more pages per day without union workers, and advertisers began switching back to the Post. Picket lines were set up at stores around the metropolitan Washington area at George’s, a local discount appliance store, and K-Mart in December 1975, but failed to dissuade the advertisers from returning to the Post. 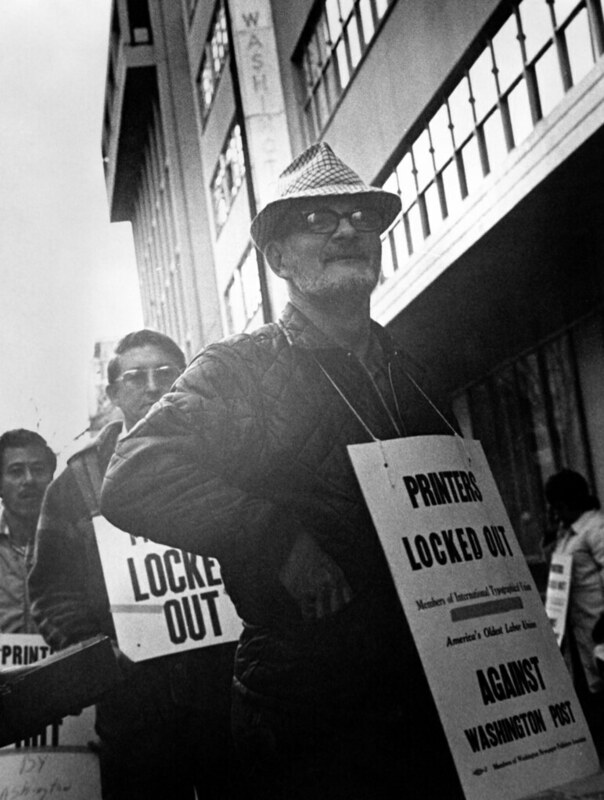 Printers’ union members picket the Post in November 1973 after union member Michael Padilla was fired for engaging in a slowdown at the paper. When printers stopped work, the Post evicted them from the building after calling US Marshals. Photo by Michael Dresser, some rights reserved. 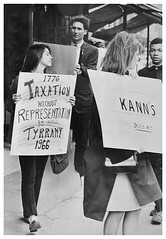 The tipping point in labor relations at the Post came during a November 1973 dispute with International Typographical Union Local 101, the printers’ union. The Post was a profitable newspaper, but its margins were slipping compared to its other holdings. New management at the paper made the determination that profits could be increased by squeezing more out of fewer workers. 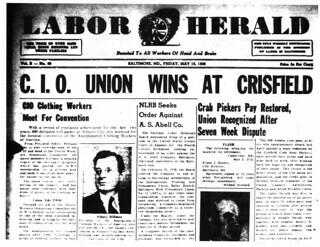 The Post prepared for a confrontation with its unions and trained non-union personnel at an anti-union facility in Oklahoma to produce the newspaper in the event of a strike by one or more of its unions. 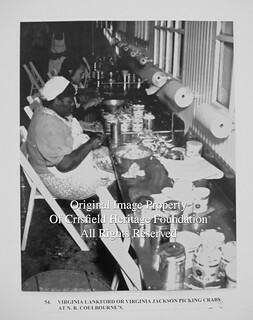 It also opened its own training facility in Northern Virginia where non-union staff were trained on the relatively new “cold” type press production that needed fewer workers. The printers were the largest union at the Post and prepared the molten lead “hot” type for printing. They stood in the way of the Post’s drive to cut costs and increase profits. The printers began engaging in a work slowdown to pressure management to back off its aggressive bargaining posture as they approached the expiration of their labor contract. The management retaliated by firing one printer, Michael Padilla, for engaging in the slowdown. The union responded with a sit-down strike and the Post evicted them from the building after calling US Marshals. 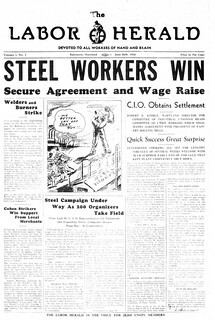 The Post management then prepared an edition of the paper with non-union staff and prepared to run the presses themselves. Members of the pressmen’s union were made aware of the Post’s plans by other union members in the building and entered the Post’s facilities saying that they were the only ones entitled to run the presses and they intended to do so. However, they quickly staged their own sit-down strike and some minor damage was done to a few presses. They halted the paper from publishing and took the position they would not work until all other unions returned. The Post negotiated a quick settlement with the printers and reinstated Padilla. All the unions returned to work with nothing said about the minor damage. The pressmen were heroes to other craft union members. 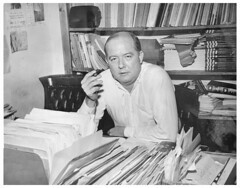 But to the Post management, including publisher Katherine Graham, they had a bulls-eye painted on them and over the next two years a number of smaller skirmishes were fought leading up to the expiration of the pressmen’s labor contract. Pressmen outside the Washington Post building in the early morning hours of October 1, 1975. 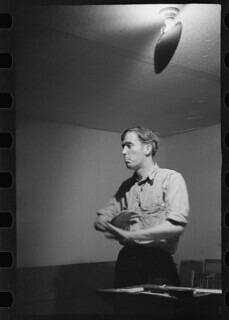 Photo: Pete Schmick, Courtesy DC Public Library, Star Collection, © Washington Post, All Rights Reserved. The regular pressmen numbered about 200, of whom only about 100 were long term employees. Most of the others migrated to Washington from out-of-town papers for higher wages or because their local unions had been broken during strikes at other newspapers. The pressmen were viewed as the strongest union at the Post and set the pace for the other nine unions. Their contract was due to expire September 30, 1975, but the pressmen didn’t plan to strike. Instead they planned to continue to negotiate while honoring the picket lines of the smaller machinist union at the newspaper whose contract expired at the same time. However, the machinists were forced to back off of a strike at the last-minute when the Post invoked a binding arbitration clause in the machinists’ contract. The pressmen’s union leadership decided not to call a strike right away, but a relatively small, organized group of pressmen began disabling the presses at about 4 am and detained and injured a manager. A small fire was set in the printing press room. The strike was on when workers left the building and set up a picket line. The union leadership then passed out strike signs that had been previously printed in the event of a work stoppage. 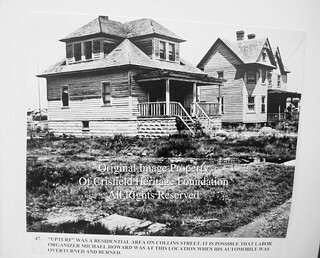 The Post was unable to publish for a day, but cobbled together non-union offset print shops around the region to print a reduced version of the paper on the second day and began returning their own presses to running order. They flew the paper produced at the Post by helicopter to printing facilities located within 200 miles of Washington. Later they printed the Sunday and other supplement material as far away as Miami and had it trucked to Washington, DC. The other unions at the Post either went on strike or respected the picket lines of the pressmen. The exception was the Newspaper Guild, which twice held fierce debates over supporting the strike. Reacting to reports of physical abuse of some members who crossed the picket lines and the damaged presses, they overrode their leadership and voted to continue working on two different occasions, although a minority of Guild members did honor picket lines. The striking unions called for a boycott of the Post that was supported by local organized labor, but its effects were limited. The Post’s newspaper sales dropped by about 35,000 and advertising fell from about 70% of the newspaper market to about 65%–significant, but not crippling. Some major advertisers switched to the Star and others advertised more heavily in the rival paper. The Post’s public relations successfully exploited a highly exaggerated version of the pressroom damage (The Post filed suit for $25 million, but the actual damage figure did not exceed $270,000) as an attack on the “free press.” Later the Post demonstrated its power when a grand jury was convened to investigate strike activities, further demonizing the workers. As advertisers began to return and revenue began to rebound by late November, the Post made a final offer to the pressmen’s union, a formality before hiring permanent replacements. The offer would have essentially torn up the expired pressmen’s contract, while providing for some nominal pay raises. The offer was rejected by a vote of the union members and the Post began advertising for permanent replacements for the pressmen in December. 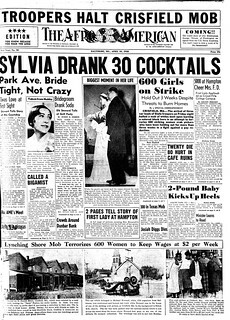 The Post also isolated the pressmen’s union from much of the rest of the city by repeatedly pointing out the lack of any significant number of African American or women press operators in a city that was nicknamed “Chocolate City” and had more women than men. 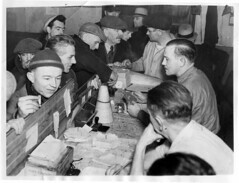 They moved to further divide the unions from the city’s working people by exploiting long-standing charges of discrimination against the craft unions and reached an agreement with the Washington Printing Specialties & Paper Products Union, whose members moved the heavy rolls of paper around the shop and performed other manual labor. 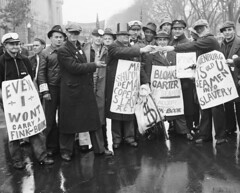 The 100 member union was predominantly African American and had been battling the mainly white craft unions over discrimination against its members before the strike and had filed suit against several–although not against the pressmen’s union. They returned to work and joined many of the Newspaper Guild’s members crossing the picket lines. While not essential to publishing the paper, the agreement with the paper handlers union legitimized the Post’s position and further discredited the strikers in the eyes of many African Americans. The momentum in the battle had clearly swung toward the management. 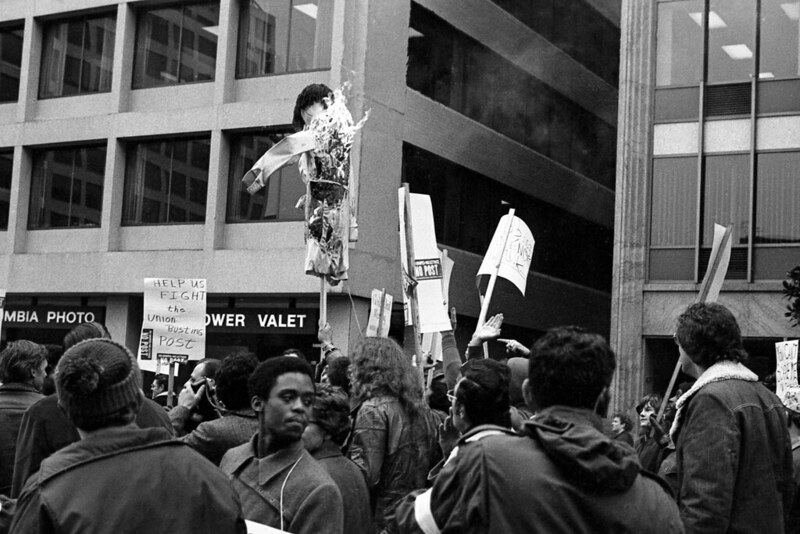 Over 1,000 striking pressmen and supporters staged a march and rally on the one year anniversary of the strike on October 2, 1976 that culminated with burning Katherine Graham in effigy in front of the Post headquarters. Photo by Reading/Simpson, non-commercial use permitted. As the strike moved into 1976, the Post was effectively producing the newspaper at its own printing plant with the permanent replacements of the pressmen and non-union pressmen imported from other areas of the country. 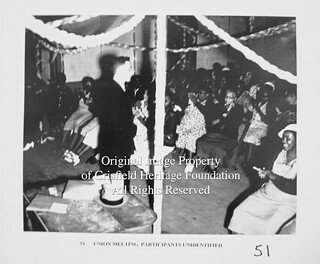 The permanent replacements were mainly African Americans along with a few women. The diversity of the replacements was showcased by the Post. 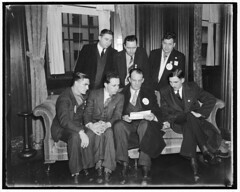 The Post unions had a support committee that worked hard to convince the broader public to back the strike. 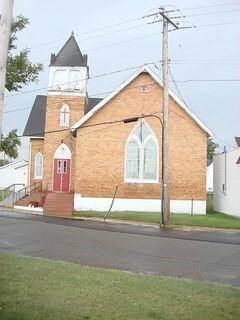 At one point a petition was circulated among prominent local residents asking that the dispute be submitted to binding arbitration. The Post refused arbitration. 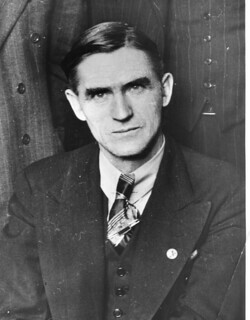 AFL-CIO president George Meany held a meeting with publisher Katherine Graham, but accounts of the meeting indicate that Meany didn’t push hard and Graham was firm that the pressmen had been permanently replaced. With defeat staring at them, the other Post unions undertook serious negotiations with management over resolving their own issues. 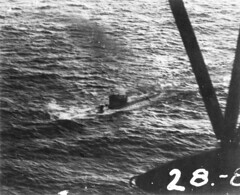 Individual members of the various craft unions began drifting back to work. On February 17, 1976 the mailers’ union, who sorted and bundled the newspapers, reached an agreement with the Post. They returned to work along with the printers’ union—representing about half of the 1,400 craft union workers. 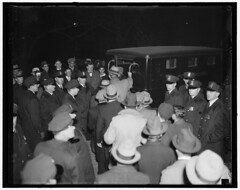 The other unions and their members followed shortly thereafter. The strike was lost at this point and the pressmen’s union was broken. 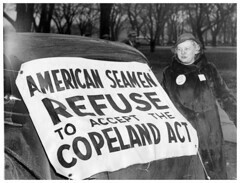 They were now out on their own–along with a few members of other unions who refused to go back and a committed group of supporters. The U.S. Attorney obtained indictments against 15 pressmen while none of those who crossed picket lines and assaulted strikers were charged. 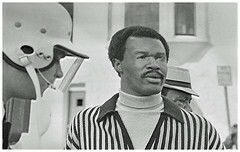 On the first anniversary of the strike– October 2, 1976–over 1,000 pressmen and their supporters rallied at McPherson Square and marched to the Post building where they burned Katherine Graham in effigy. The march was defiant, but for the pressmen it was more like a funeral. The pressmen continued to picket the Post through the judicial proceedings. On May 20, 1977, after plea agreements were concluded in court, fourteen pressmen were given sentences that ranged from fines for most individuals to a year in jail for one pressman. The light sentences for most pressmen vindicated their account that the initial disabling of the presses was relatively minor, but it was a hollow victory. Local 6 was decimated by the strike and ceased to exist after the Washington Star newspaper folded in 1981. 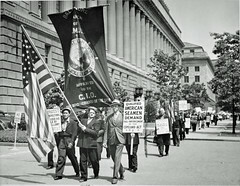 The strike was one of the biggest defeats ever suffered by organized labor in the District of Columbia. Could the Pressmen Have Prevailed? Helicopter at Post building one year after strike began. 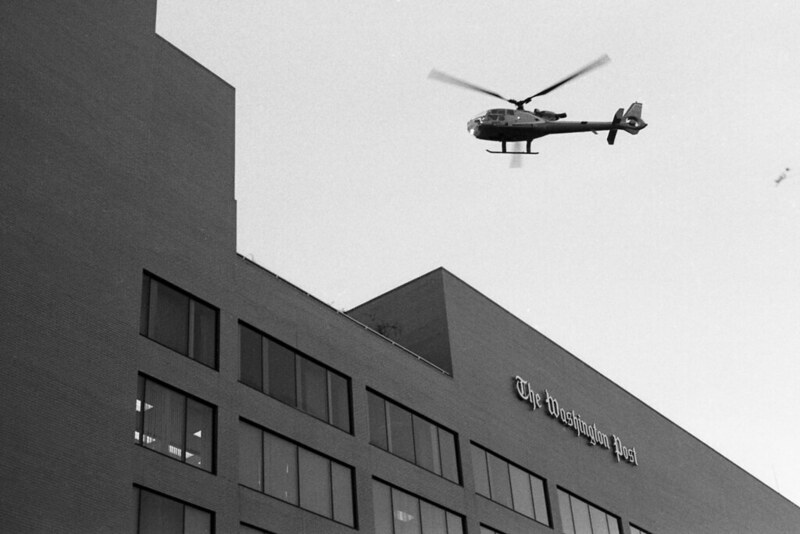 Management used helicopters in the early stages of the strike to ferry ready-to-print versions of the paper to offset print shops within 200 miles of Washington. Photo: Reading/Simpson, non-commercial use permitted. Most accounts written after the strike point to the initial disabling of the presses on October 1, 1975 as sealing the pressmen’s fate, but that is an oversimplification. Even with the Post’s account of “violence” monopolizing the media, the outcome was not certain two and half months into the strike. Certainly the property damage was a factor in the Guild’s decision not to honor picket lines and gave the Post ammunition to use against the strike. 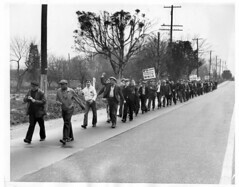 But a significant number of Guild members would have crossed the picket lines in any event and the Post intended to publish utilizing non-union labor even if no damage had occurred. 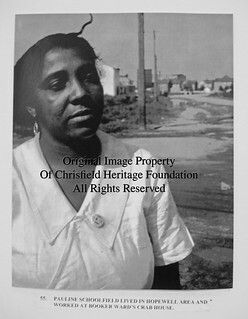 Simply pointing to the “violence” in which one person was hurt and some relatively minor damage done to property does not take into consideration that the Post settled the 1973 dispute after similar, although not as widespread, disabling of the presses. The larger error that the pressmen made was viewing the impending confrontation as a traditional battle fought by a group of skilled craftsmen who were necessary for production against a management that was making unprecedented demands but could be forced to back down as they had in the past. 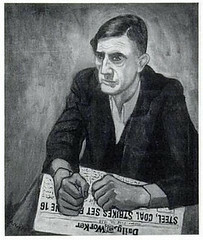 The pressmen applied the lessons they had learned from previous battles, like the printers’ dispute, and believed they could prevail by withholding their labor. The rump group that disabled the presses followed this thinking to its logical–but ultimately wrong–conclusion. Instead, the pressmen faced a powerful enemy who had negated the crafts’ advantage in earlier labor confrontations. The pressmen failed to grasp the impact that technological improvements like cold type would have on the ability to produce the paper in the workers’ absence. They further underestimated the ability of replacements and management to print a paper, despite the printing craft unions’ experience in other cities. They believed that the “liberal” Washington Post would not openly “bust” a union. Perhaps most critically, they didn’t have a winning strategy to sway the broader public to their cause. In such circumstances, the pressmen were unprepared to cast their battle as part of a larger struggle of working people that were then vigorously resisting similar demands. Employers during the 1970s sought to reverse hard-won work rules and increase productivity while holding down wages due to increased international competition and flattening profits. Workers in the Washington area and around the country were waging strikes, both legal and illegal, over the employers’ demands for more work with less pay in order to maintain their profit margins. However, these slogans did not resonate. Some accounts after the strike simply noted that Washington was not an industrial city with strong unions. This is not entirely accurate either. The city is not industrial in nature, but the upswing in public employee unions in the late 1960s and early 1970s actively engaged tens of thousands of workers in and around the city. 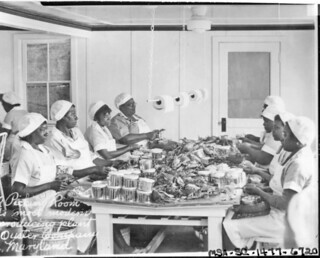 Strong established unions already existed in the hotels, grocery, communications, transit, trucking & warehouses and in construction as well as other sectors. And, workers were in a fighting mood, like those across the country. 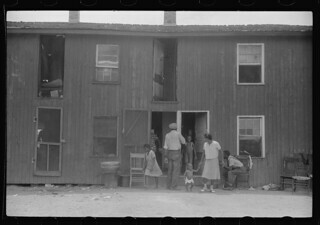 Further, the pressmen left themselves vulnerable to be divided from a large, natural ally in the metropolitan area–African Americans who supported unions in much higher percentages than other population groups. Of the craft unions, the pressmen weren’t the worst when it came to discrimination. They were not one of the unions sued by the paper handlers at the Post. 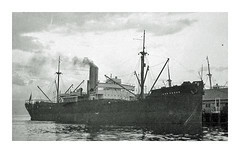 They had taken on some African American apprentices and junior apprentices and had a few black journeymen. However, that didn’t alter the fact that they were overwhelmingly white in a city that was overwhelmingly black, and the larger public didn’t make fine distinctions among the various craft unions. 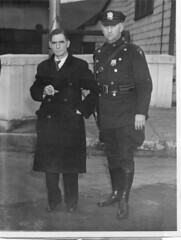 Unlike the city’s transit union leadership which helped force a desegregation of operator ranks within the union in 1955 prior to a long strike with the Capital Transit Company in order to diffuse the issue, the pressmen’s union did not fully recognize the damage that would be done to their position. And that’s without considering the good will that would have been generated by strides toward full desegregation of their ranks. It’s easy now to look back and debate what should have been done 40 years ago to prepare for this confrontation and it should be remembered that the pressmen and the other craft unions, despite whatever weaknesses they had, waged a toe-to-toe battle against a determined foe for nearly three months before the tide turned against them. We’ll never know if a clear message linking the Post unions’ struggles with those being waged by other working people, along with a reputation as a progressive union, would have made a difference in the outcome. But we can know that doing so would have made for a more effective boycott, reducing subscribers and thereby keeping more advertising dollars away from the Post. This in turn would have strengthened the rival Washington Star, putting increased pressure on the Post to reach an agreement. As a young union activist, I brought the Post craft unions’ boycott materials to my transit union meeting. Some of the officers of the union removed the material from the sign-in table and castigated me for supporting a strike of unions that had discriminated against African Americans. We argued for a while and a lot of the rank and file at the meeting listened in interest, but the damage that was done to the strike’s cause by unions that had failed to take meaningful steps to integrate their ranks cannot be overstated. 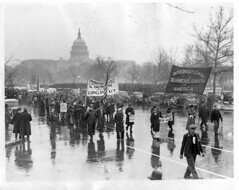 Most of the material for this article came from the Washington Star, New York Times, Washington Post, Washington City Paper and flyers produced by strike supporters.